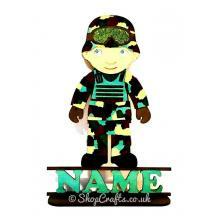 Soldier themed personalised shape on stand. The perfect accessory for any little one's nursery or bedroom, this detailed laser cut soldier stands tall and proud on top of the name of your choice! Each one is hand painted as pictured or in the colours of your choice - I've gone for the obvious choice of camouflage but it's entirely up to you (just use the relevant box to let me know your preference, or else feel free to drop me a message to discuss!) and is finished in places with optional glitter for extra sparkle!! The reverse will be left in the natural wood finish. The soldier and name section simply slots into place on the base to allow it to be freestanding, and the item is cut from standard 3mm thick MDF. Unfortunately there is only room for a single name underneath the shape - please pop the required name in the box when ordering. 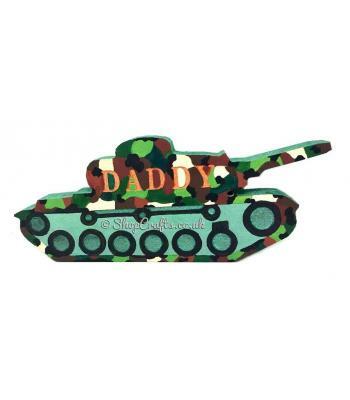 Please note this is part of a large range of themed products including bookends, clocks, dream catchers, freestanding letters and more - perfect for accessorising the ultimate army themed room! Please message me for details or see my other listings. 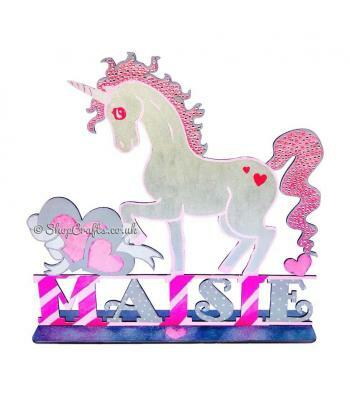 Large Unicorn theme personalised shape on stand. 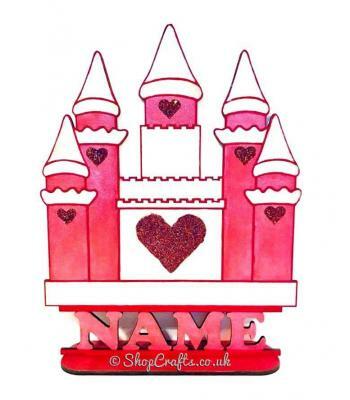 Princess Castle theme personalised shape on stand. 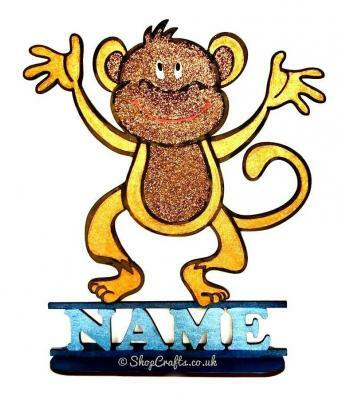 Cheeky monkey shape on stand with name.